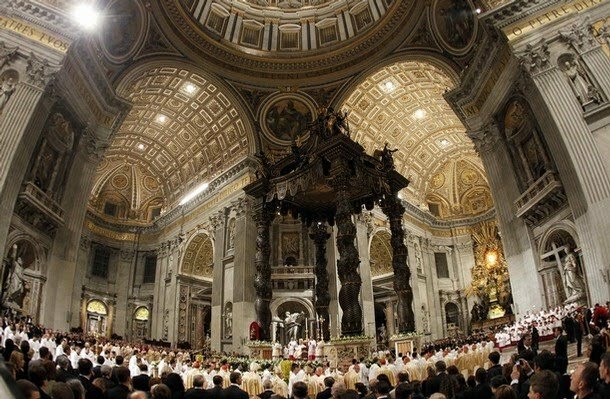 "None of us can ever forget how in that last Easter Sunday of his life, the Holy Father, marked by suffering, came once more to the window of the Apostolic Palace and one last time gave his blessing urbi et orbi. We can be sure that our beloved Pope is standing today at the window of the Father’s house, that he sees us and blesses us...."
Lest anyone forgot, that was the climactic thread of Cardinal Joseph Ratzinger's funeral homily for John Paul II. 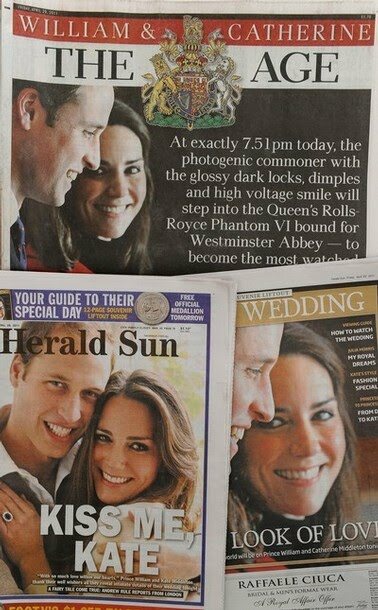 As for what he's got up his sleeve this time around, we'll know in about five hours. Like its predecessor, though, we can be fairly sure it'll likewise stand the test of the years. Indeed, church, what a night it's been... and as ever, with tens of thousands already standing or sleeping at the barricades -- and the waiting crowd multiplying in size by the minute -- the best is yet to come. "Mary, Teach Us to Build Up the World": For and From JP2, B16's "Ave Maria"
Clad in an ermine-lined Easter mozzetta his predecessor never would've worn, B16 appeared via videolink at the close of tonight's Beatification Vigil to give the final blessing to the swelling crowd at Circus Maximus. 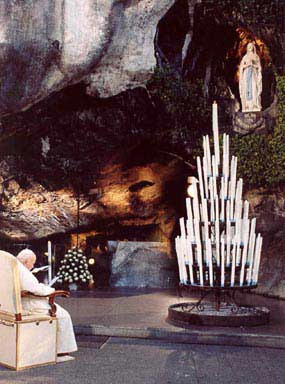 Prior to doing so, however, the reigning pontiff reprised the text of a prayer penned and delivered by John Paul II at the end of his days -- the soon-to-be Blessed's opening prayer at the Grotto of Massabielle on the last of his 104 foreign trips: the frail Pope's August 2004 visit to Lourdes, Europe's most beloved Marian shrine... and in a particular way, the sanctuary of the sick. 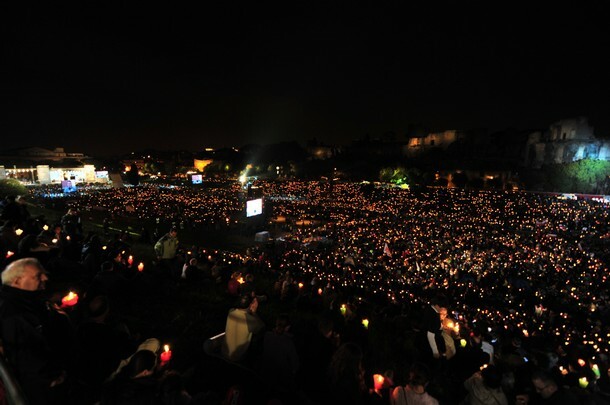 "He Believed, He Loved" -- On Beatification Eve, Recalling "Our Beloved Pontiff, our Prophet of Hope"
Before a sea of pilgrims estimated in excess of 100,000, here below is an English translation of the talk given by the papal vicar for Rome, Cardinal Agostino Vallini, at tonight's Vigil at Circus Maximus for tomorrow's beatification of Pope John Paul II. Divine Providence gives us this evening the joy of a great experience of grace and light. With this Marian prayer vigil we hope to prepare ourselves for tomorrow’s celebration, the solemn beatification of the Venerable Servant of God John Paul II. Even though it has been six years since the death of the great Pope—Bishop of Rome and Pastor of the universal Church for 27 years—his memory is particularly vibrant. 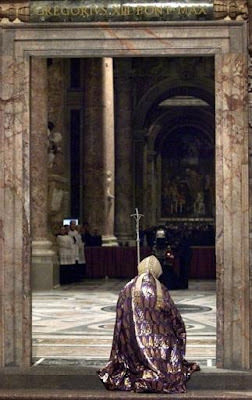 We feel veneration, affection, admiration, and deep gratitude for the beloved pontiff. We, above all, remember his witness of faith: a convinced and strong faith, free from fear or compromises, true until his last breath, forged by trails, fatigue, and illness, whose beneficent influence has spread throughout the Church, indeed, throughout the world. His witness, through his apostolic travels, inspired millions of men and women of all races and cultures. He lived for God. He offered himself entirely to God to serve the Church as a sacrificial offering. He would often repeat this prayer: "Jesus, Pontiff, who handed himself to God as offering and victim, have mercy on us". His great desire was to become more and more one with Christ the Priest through the Eucharistic sacrifice from which he drew strength and courage for his tireless apostolic action. Christ was the beginning, the center, and the apex of each of his days. Christ was the sense and the purpose of his actions. From Christ he drew energy and fullness of humanity. This explains the need and the desire he had for prayer: Each of his days was dedicated to long hours of prayer and his work was penetrated and infused by prayer. In this faith, which he lived in his most inner being, we can understand the mystery of the suffering that marked him from when he was young and which purified him like gold that is tested by fire (1Pt 1:7). We were all amazed by the docility of spirit with which he faced the pilgrimage of his disease, even to the point of agony and death. He was witness to the tragic age of big ideologies, totalitarian regimes, and from their passing John Paul II embraced the harsh suffering, marked by tension and contradictions, of the transition of the modern age toward a new phase of history, showing constant concern that the human person be its protagonist. He was a staunch and credible defender of the human person to the nations and the international institutions, which respected him and have paid him homage, recognizing him as a messenger of justice and peace. With his gaze fixed on Christ, the Redeemer of humanity, he believed in humanity and showed his openness, trust, and closeness. He loved the human person, pushing us to develop in ourselves the potential of faith to live as free persons, cooperating in the realization of a more just and caring humanity, as workers for peace and builders of hope. Convinced that only the spiritual experience can satisfy humanity he said: the fate of every person and of all peoples is tied to Christ, the only liberator and Savior. In his first encyclical he wrote: "Man cannot live without love. … His life [remains] senseless, if love is not revealed to him … Christ the Redeemer "fully reveals man to himself" (RH, 10). He began his pontificate with these vibrant words: "Don’t be afraid! Open, open wide the doors to Christ! … Christ knows what is in the human person. Only he knows!". These words bear witness that he believed that God’s love is inseparable from the love for humans and their salvation. In his extraordinary energy of love for humanity he loved, with a kind and tender love, all those "wounded by life", as he called the poor, the sick, the nameless, and those excluded a priori—but he had a particular love for the youth. His calls for the World Youth Days had the purpose of making youth into the protagonists of their own future, becoming builders of history. The youth, he said, are the wealth of the Church and of society. He invited them to prepare for the big choices to be made, to look ahead with confidence, trusting in their own abilities and following Christ and the Gospel. Dear brothers and sisters, we all know John Paul II’s singular devotion to the Madonna. The motto on the coat of arms of his pontificate, Totus tuus, summarizes well his life, which was oriented toward Christ by means of Mary: ad Iesum per Mariam. As the disciple John, the "beloved disciple", under the Cross at the Redeemer’s death, took Mary into his home (Jn 19:26–27), John Paul II wanted to always keep Mary mystically close to himself, making her part of his life and his ministry, feeling embraced and loved by her. The remembrance of our beloved pontiff, prophet of hope, should not mean a return to the past for us, but let us make the most of his human and spiritual heritage; let it be an impetus to look forward. May the words that he wrote in his apostolic letter Novo millennio ineunte from the great Jubilee Year of 2000 resound in our hearts: "Let us go forward in hope! A new millennium is opening before the Church like a vast ocean upon which we shall venture, relying on the help of Christ. The Son of God … is at work even today: we need discerning eyes to see this and, above all, a generous heart to become the instruments of his work." The Virgin Mary, Mother of the Church, so dear to Pope John Paul II, whom we now call upon in the praying of the Rosary, help us, in every circumstance, to be witnesses of Christ and proclaimers of God’s love in the world. Amen. 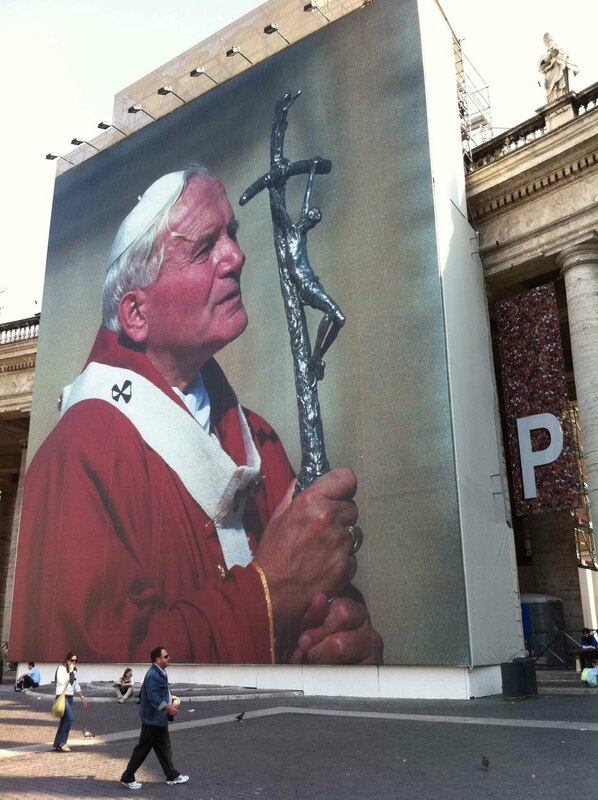 It might take another inexplicable healing to get John Paul II over the final hurdle to sainthood, but even so, it looks like the Man of the Hour is showing his appreciation for the throngs who've come in other tangible ways. After days of forecasts that predicted "lashing" rain over Rome for most of Beatification Sunday, the outlook seems to have taken a sudden turn late yesterday, with a chance of spotty showers called for overnight, but declining steadily to yield to sunshine by mid-morning. While temperatures at Mass-time should be in the 60 F/16 C range, as the skies go, we won't know for sure what happens for another 16 hours or so. Still, even with the natives well-known for invariably raining scorn on the oft-botched foresight of their weathercasters, there is precedent of the Blessed pontiff's ability to win some notable "divine intervention" with the elements. Born of the World Youth Day experience and a signal fruit of John Paul's call for the church -- especially its young -- to engage the media world, the Toronto-based outlet likewise premiered a sit-down with John Paul's deputy private secretary, now Archbishop Mietek Mokryzycki of Lviv in the Ukraine, in the run-up to this weekend's rites. Given his closeness to the new Beatus, the 50 year-old prelate will be the only non-cardinal concelebrating the Beatification Mass alongside B16. 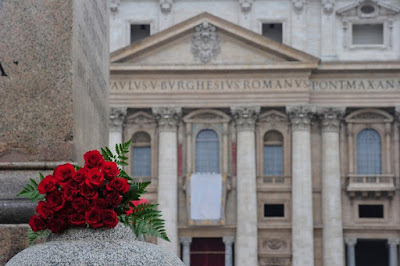 Earlier today, with a light rain falling on Rome, the tapestry of John Paul II that'll be unveiled once his successor pronounces the formula of beatification tomorrow morning was hung over the central balcony of St Peter's. At the same time, though, what's invariably the key gathering-spot for Roman pilgrims is now off-limits until the Main Event. 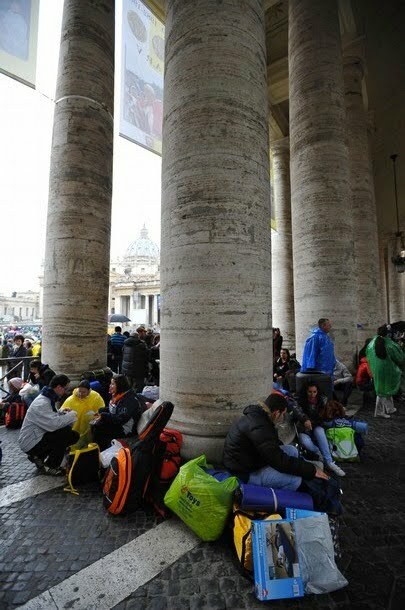 To prepare the area where over a million of the faithful are expected to converge from before sunrise, the basilica, square and the Via della Conciliazione that leads to both were shut down this afternoon until 5.30 tomorrow morning. Then again, tonight's focus had long ago been directed elsewhere -- to Circus Maximus, where the city's official Vigil gets underway from 8pm (all times Rome). Alongside the Luminous Mysteries of the Rosary which John Paul introduced in 2003 and video testimonies from young people, the three-hour event will feature reflections from two of the late Pope's top aides -- John Paul's secretary of four decades, now Cardinal Stanislaw Dziwisz of Krakow, and his influential spokesman, the Spanish layman Joaquin Navarro-Valls -- along with Sr Marie Simon-Pierre, the French religious whose cure from Parkinson's disease was attributed to John Paul's intercession and secured his passage to the penultimate step to sainthood. 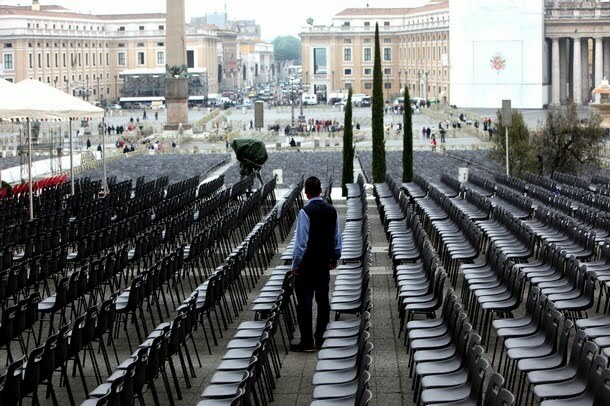 B16 will close the vigil with a video-linked address; having spent the week resting up at Castel Gandolfo, the Pope is returning from his retreat this afternoon. 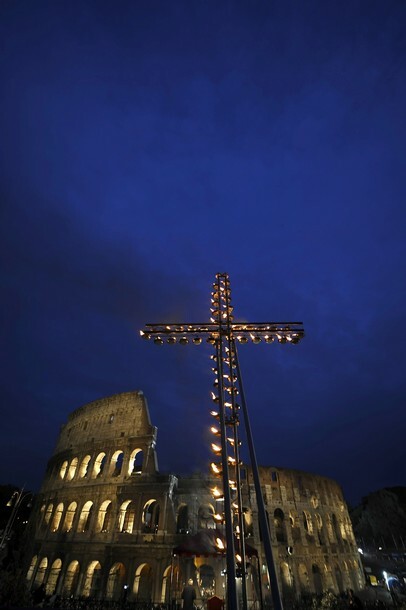 Following the evening event, eight historic churches along the path from the Circus to St Peter's will remain open for prayer through what's being called the "White Night" before Beatification Morning dawns. 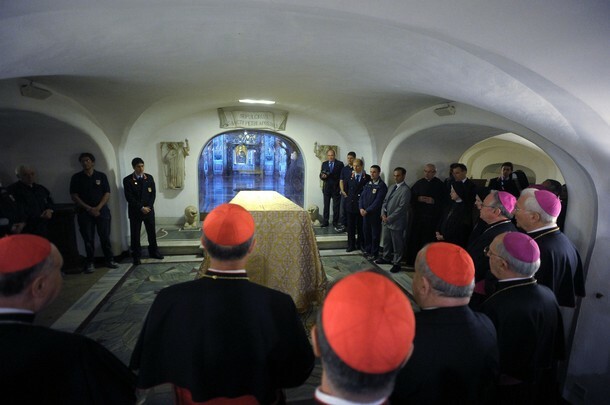 Early yesterday, the coffin of the late pontiff was removed from the spot it's kept these last six years in the Vatican Grottoes beneath St Peter's and placed before the first Pope's tomb (above). Covered in a gold pall, it'll remain there until the Mass tomorrow, when it's moved to the front of the High Altar for the veneration of the faithful following the liturgy, beginning with Benedict XVI, himself. So that everyone who wishes to do so can pass by, the basilica will stay open until dawn on Monday. That evening -- following a mid-morning Mass of Thanksgiving outside -- Blessed John Paul's remains will be placed in their new tomb on the main floor, in the side-chapel dedicated to St Sebastian. Thanks to its newly-launched video player, Vatican television will feature both tonight's and tomorrow's ceremonies live and on demand, with the option of either "clean" audio or translation and commentary in any of five languages. That said, however, something special in the beatification's coverage is taking place across the Pond from Rome, and anyone who'd really want the day to feel a bit more like "Christmas" might find it the day's most memorable option of all. Now retired to his native Philadelphia and suffering the effects of leukemia and anemia, Cardinal John Foley will ride again early tomorrow, as the much-loved narrator of John Paul's life and death for English-speaking audiences worldwide does real-time commentator duty for the local CBS affiliate where, as a high-schooler, his broadcasting days began. 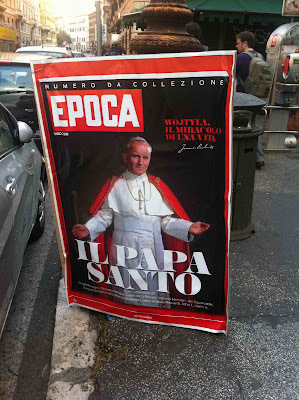 Prior to his February retirement and homecoming after 27 years in Vatican service, the longtime chief of the Holy See's media efforts had earnestly hoped to be able to stay around for the beatification rites, and make it his "last stand" in the play-by-play booth. While Foley's rapidly weakening health precluded that from happening, the cardinal apparently jumped at the offer to do it from home. Having already recorded some of his reminiscences for radio, "His Foleyness" goes live from 4-6am Eastern on the River City's KYW, which plans to stream it online. …e adesso, noi torniamo a te. Well, gang, good morning from Rome and what promises to be a beatification for the books. For starters, just in case any doubt remained that JPII is back in a big way, that shot from the Square yesterday should probably clear things up. As the scene goes, Day One was fairly calm -- the brunt of the crowd (expected to top out somewhere between one to two million) has yet to arrive, but the feeling around is a well-afoot buzz, with traffic warnings flashing around to remind drivers that the city center around the Vatican is set to be closed to traffic early Sunday. At the same time, given the Anglosphere's main focus on this Friday morning, by contrast, the locals would probably ask "What royal wedding?" The figure of the late pontiff is dominating the airwaves, with John Paul II's greatest hits playing in a loop on the RAI channels (against a backdrop of triumphal music) and the president of the Pontifical Council for the New Evangelization, Archbishop Rino Fisichella, sitting in as a guest-anchor on the state broadcaster's morning show to talk up the Wojtyla legacy. All that said, it's good to be back in town. It's been a while -- a very long while, to be honest -- and these pages have never before come your way from the Main Office. Accordingly, that's already made for chaos in some parts of the Curia... but given the circumstances, maybe that'd be conspicuous by its absence. Looking ahead, we've got a full plate in store -- three days of beatification events beginning tomorrow, whatever else comes up along the way... and, of course, Monday's first-ever Vatican meeting on the world of new media (the first leg of which, in a generous, humbling tribute to everyone who's made these pages possible these last six years, this scribe has been tapped to moderate). This will all take a bit of pacing to get through, but good thing the coffee's as strong as the lunches run long. As ever, church, all thanks always -- and while we're at it, all apologies for being horribly scattered and/or crazed these last few weeks, and everything fallen through the cracks along the way. Now you know why that's been the case... still, such is the way things go that what doesn't get done tends to loom far bigger in my mind than what does. If only the wrists could keep up. Oh, and one more thing -- if anyone's got any special intentions you'd want remembered over here, especially during the few minutes I'll have at the novus Beatus' side following the rites on Sunday, please send them along one way or another and I promise to see 'em home, OK? Above all, know how much you've each and all already been in mind and heart over here, and will be even more as the days build along. Buona mattina and Blessed Easter Friday. More later... and now, back to the crowd. “Peter came to Rome! What else but obedience to the inspiration received from the Lord could have guided him and brought him to this city, the heart of the Empire? Perhaps the fisherman of Galilee did not want to come here. Perhaps he would have preferred to stay there, on the shores of Lake of Genesareth, with his boat and his nets. Yet guided by the Lord, obedient to his inspiration, he came here! Taken from his homily at the Mass inaugurating his ministry as "universal pastor" of the church, the above text will serve as the feast-day proper for the Office of Readings of Blessed John Paul II. Not coincidentally, the very same date that text was given -- 22 October -- has been chosen as the Polish Pope's liturgical celebration. In accord with the traditional veneration of blesseds being limited to those places where their sanctity directly touched, the feast has already been inserted into the calendars of the diocese of Rome and the entire church in Poland. Given the global following of this blessed, however, the Holy See has indicated that other jurisdictions may petition to have it recognized as an optional memorial on their respective turfs. As the case could well be made that JPII enjoys a "national cultus" in the Stateside church, well, here's to at least one happy agenda item for the June Meeting in Seattle. Either way, the "first one's free," as it were -- worldwide permission has been given for local Masses of Thanksgiving for the beatification, to be celebrated using the John Paul Mass-texts, at any time over the year beginning with Sunday's rites in Rome. All that said, church, welcome to the feast. As ecclesial notes go on the service, one significant thread is that for the first time, the UK's top tier of Catholic hierarchs will be in attendance, as Archbishop Vincent Nichols of Westminster, his predecessor Cardinal Cormac Murphy-O'Connor, Cardinal Keith O'Brien of St Andrews and Edinburgh and the primate of All Ireland, Cardinal Séan Brady of Armagh have all been invited to the Westminster Abbey rites. On a related note, after a long, difficult road through the three centuries following the Reformation, what was arguably the church's signal moment of public reemergence into the mainstream of British life came at a prior royal wedding, as Murphy-O'Connor's predecessor at Westminster, the iconic Benedictine Cardinal Basil Hume, was invited to offer a prayer at the 1981 marriage of Prince Charles and Lady Diana Spencer. This time, however, the lead prelates won't have speaking parts, simply looking on from inside the quire. So, gang, after a long Lent, intense Holy Week, Easter -- and, of course, three appointments in all of 10 days (with even more visible in the near-distance) -- time to take a breather... not for too long, though. Right now, see, Job One is simply getting through in one piece. That said, Big Weekend ahead -- get ready. In the meanwhile, quick updates as needed on Page Three... and for all the rest, see you Friday, after a good bit of sleep. Just over six months ago, it was routinely taking the Holy See well over a year -- or often, even close to two -- to find replacements for US bishops who had reached the retirement age of 75. For the second time in as many days, however, what had become the customary wait-time has seen itself slashed in half. This morning, B16 named Miami's senior auxiliary, Bishop Felipe Estévez, 65, as bishop of St Augustine, succeeding Bishop Victor Galeone, a onetime missionary in Peru who's headed Florida's mother-diocese since 2001 and turned in his requisite "walking papers" last September 13th. 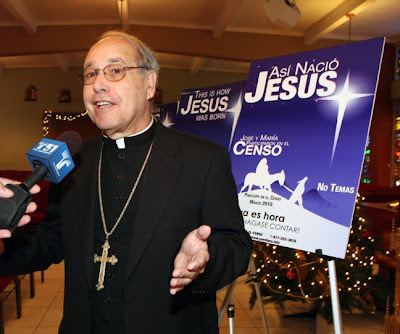 A Cuban exile cherished by many for his pastoral focus and kindness, the Upstate nominee -- who was left the island as a boy via the Pedro Pan airlifts of the early 1960s -- spent his seminary days in Montreal before his 1970 ordination in the US for a Cuban diocese. After further studies in Honduras, Estévez was incardinated into the South Florida church in 1975, and after being sent for an advanced degree in spiritual theology at Rome's Pontifical Gregorian University, spent the bulk of his priesthood in priestly formation and spiritual direction work before being named an auxiliary of Miami in 2003. Now home to some 195,000 Catholics, the St Aug church -- which, as numbers go, is anchored by Jacksonville, now Florida's largest city -- has seen something of a boom over the course of Galeone's decade at the helm, particularly among its numbers of Hispanic and Haitian faithful. Given the upstate reality's new reflection of South Florida, a Miami-based appointee is the closest outside thing to a natural fit for the post. The appointee is the third Miami priest to be given a diocese in just over a year, following Rome's October 2009 choice of a fellow exile, the local pastor and high-school president Fr Fernando Isern, as bishop of Pueblo, and last October's appointment of the archdiocese's junior auxiliary, John Noonan, to Orlando, where he succeeded Thomas Wenski -- the iconoclastic, Harley-riding South Florida native -- who was returned home as archbishop nearly a year ahead of schedule. With over 1.3 million Catholics in what's now the nation's eighth-largest metropolis, Miami is the Southeast's largest local church, and is widely tipped to become a cardinalatial see in the years just ahead. As the Sunshine State's wider scene goes, meanwhile, the St Augustine nod is the third to fall in Florida over the last year, following Wenski's homecoming and Noonan's transfer. It won't be the last, however -- following Bishop John Ricard's early retirement for health reasons, the Panhandle diocese of Pensacola-Tallahassee stands vacant... not to mention the Holy See's impending response to Wenski's quickly-placed petition for replacement auxiliaries in Miami, at least one of whom could well be coming from outside. In accord with the norms of the canons, Estévez must be installed in his new cathedral -- the nation's "first parish" -- within two months. With this morning's move, the top posts of six Stateside Latin churches remain open, with another six dioceses led by prelates serving past the retirement age, four of them older than Galeone. OK, Hoosiers -- after months of fevered expectation over a combined four nods, suffice it to say, you can relax now. At Vatican Noon, B16 dispatched the cleric (left) -- currently doing triple-duty as vicar-general of the archdiocese of Louisville, pastor of Holy Trinity parish there and chaplain to a local high school -- across the Ohio River as bishop of Evansville, succeeding Bishop Gerald Gettelfinger, who's been the 90,000-member diocese's "servant leader" since 1989, and reached the retirement age of 75 last October. The newly-emeritus prelate marks his golden jubilee of priesthood on 7 May. In a significant generational shift, however, his successor won't see his quarter-century of ordination for another 13 months hence. Described by friends as a “down-to-earth,” “tremendously kind, generous" person, "pastoral canonist” -- and, above all, “a man of the Eucharist” -- the bishop-elect is the second Louisvillean to be called to the high-hat in the last 15 months, following Bishop Bill Medley of Owensboro, who was sent to the Western Kentucky church early last year, but only after Thompson’s name dominated the early conversations for the O'boro chair. For purposes of context, the last time a Louisville priest had been elevated to the episcopacy before Medley came in... 1988. 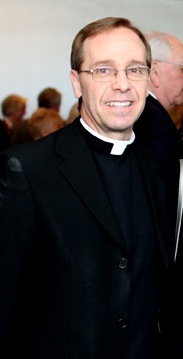 A protege of his hometown’s retired Archbishop Thomas Kelly OP (who lives with the nominee at Holy Trinity's rectory), the alum of Evansville-adjacent St Meinrad’s and advanced studies in the canons at St Paul’s in Ottawa had been serving as Louisville’s lead tribunal hand until being named vicar-general by Archbishop Joseph Kurtz shortly after the latter’s 2007 arrival. Last December, the now-USCCB vice-president named Thompson as rector of the Cathedral of the Assumption, albeit with the appointment not effective until June. Ergo, with the bishop-elect's successor at Holy Trinity already named, Kurtz suddenly finds himself short a #2 and cathedral rector at home. I have always attributed a great part of my vocation as a priest to the deep Catholic roots of my family. My parents were born, raised and married in Marion County, which boasts the highest percentage of Catholics per population of any county in Kentucky (53%). Both of my parents are products of large Catholic families. Not surprisingly, given the fact that I have ninety first cousins, one of my cousins is also a priest in Louisville. I was born in Louisville, but spent the better part of my grade school years in Marion County, where I also made my First Communion at St. Joseph Church. We moved back to Louisville when I was approximately eleven years old. As a child, I was always intrigued by the life of a priest. In middle school, I began to be more aware of social justice issues. As I got older, I began to ask myself how my life could make a difference in the lives of others. Since I had always gone to Mass with my family, the notion of being a priest came to mind as one answer to my question. While I would consider the idea of priesthood from time to time, I played sports and dated in high school and college. After graduating high school in 1979, I attended Bellarmine College with a goal of obtaining a degree in Accounting and then going to law school. However, during college I began to give more thought to the priesthood. I graduated Bellarmine in May 1983 and entered Saint Meinrad School of Theology the following August. Looking back, while I did not think about it during my years of high school and college, spirituality has always been a very important aspect of my life. The need for prayer and solitude has always been vital to any sense of happiness in my life. While growing up, my family attended Mass each Sunday and prayed the rosary each night. But I especially enjoyed being outdoors, particularly in the country, taking walks in the fields and just reflecting. My seminary experience at Saint Meinrad instilled in me an even deeper appreciation for prayer, both communally and personally. I was ordained a priest in May 1987. After serving as Associate Pastor to St. Joseph Proto-Cathedral in Bardstown for three years, I was sent to St. Paul University, in Ottawa, for studies in Canon Law. I obtained my licentiate, a master's degree, in May 1992. I believe that my studies in canon law actually enhanced my own pastoral ministry and service as a priest. Since that time, I have served in various archdiocesan and parish capacities. I currently serve as Pastor to Holy Trinity Parish in Louisville while teaching canon law at Saint Meinrad and providing other canonical services. My spirituality continues to be nurtured by the celebration of the Eucharist, reflection on Scripture, daily prayer, regular spiritual direction and my monthly priest support group. I try to celebrate the Sacrament of Reconciliation every six weeks. The Eucharist is clearly the center of my life, ministry and service. This is clearly the focus of my intimacy with Jesus Christ, which gives purpose and meaning to all I am about as a priest and a Catholic Christian person. As such, I have found great satisfaction in practically every facet of ministry as a priest. A close friend of his onetime seminary rector, now his metropolitan, Indianapolis' Archbishop Daniel Buechlein OSB, the bishop-elect must be ordained and installed within four months of this morning's appointment. That said, a June ordination date has already been floated -- and given their bond, the recently stroke-ridden (and still-recovering) Indy prelate is expected to be in sufficient shape to do the honors as principal consecrator. Indeed, he'd want nothing less. With this morning's shift, the top posts of six Stateside Latin churches remain vacant, with another nine awaiting the successors to ordinaries who've passed the retirement age and submitted their "walking papers" to the Holy See. While it's fairly common for Stateside bishops to take to TV and radio over Holy Week and Easter to speak on the more traditional mysteries that mark these days, the figure who's arguably the US church's most compelling, effective, and even most beloved, major figure -- Archbishop Wilton Gregory of Atlanta -- gave an especially intriguing interview to the 404's NBC outlet, which aired earlier today. Not to speak out of school or anything, but with a certain wildfire of buzz already well ablaze in the backyard -- one that, indeed, has been registered even from points beyond -- to put it mildly, the above has the effect of dropping an oil tanker onto it. Granted, Hotlanta is famous for being the birthplace of Coke... still, amid unique and exceptional circumstances present among us in these days, its main rival's best-known slogan can't help but come to mind. And even if nothing comes of it, right now, that's a pretty widespread thought. A wise pastor once said that "anyone who's lived Holy Week right should have no energy left to do anything on Easter Monday." Hopefully you got to do exactly that, gang... on this end, though, the bliss of calm barely stretched 10 hours. As ever, par for the course. In a move the Hoosier crowd has (almost literally) been chomping at the bit about since Bishop Gerald Gettelfinger of Evansville reached the retirement age of 75 last October, multiple indications tip the morning to bring the appointment of the next head of Southwest Indiana's church of 95,000, which the departing ordinary's led since 1989. Among earlier bits of buzz, the veteran prelate reportedly said at last week's Chrism Mass that "April showers bring May flowers," with a veiled reference to his succession. The diocesan weekly, The Message, likewise leads its current electronic edition and Facebook page with info on how the faithful can learn of the handover as soon as it's announced. On a related note, as some have asked, while an effort to reconstitute the makeup of the Indy province's five dioceses had been broached from significant quarters over recent years, any movement on the idea was shelved amid Archbishop Daniel Buechlein's enduring health woes (the latest of which was a mid-March stroke from which he's still recuperating). 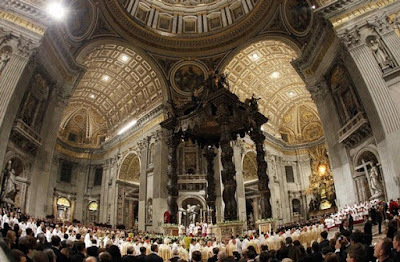 If the question returns to the fore at all, its answer will reflect the consultations taken during the US bishops' impending, long-awaited ad limina visit to Rome, which begins in November and is expected to run through the first half of 2012. Additionally, the Evansville nod will be the fourth appointment B16's made in Indiana in the last 18 months, following November 2009's move of Bishop Kevin Rhoades to Fort Wayne-South Bend, last May's elevation of Rockford's Msgr Tim Doherty to Lafayette, and January's astonishing choice of Boston's blogging Fr Chris Coyne as Indy's first auxiliary in nearly eight decades. Keeping with house custom, the name of a priest being elevated to the episcopate is never revealed before Roman Noon, as these are the last hours of peace that he'll have before the floodgates open, and he starts hearing from people he last met in 7th grade... or, for that matter, during his days at Meinrad's. And again, to one and all, every Easter blessing and good wish -- hope your Pasquetta's been easy and sweet. In the early church, the Easter Vigil would begin late and run til sunrise... and in stark contrast to today's common practice of starting within seconds of dusk, no talk of Resurrection would be had until after midnight. In the Resurrection, "Creation Has Been Fulfilled"
The central message of the creation account can be defined more precisely still. In the opening words of his Gospel, Saint John sums up the essential meaning of that account in this single statement: “In the beginning was the Word”. In effect, the creation account that we listened to earlier is characterized by the regularly recurring phrase: “And God said …” The world is a product of the Word, of the Logos, as Saint John expresses it, using a key term from the Greek language. “Logos” means “reason”, “sense”, “word”. It is not reason pure and simple, but creative Reason, that speaks and communicates itself. It is Reason that both is and creates sense. The creation account tells us, then, that the world is a product of creative Reason. Hence it tells us that, far from there being an absence of reason and freedom at the origin of all things, the source of everything is creative Reason, love, and freedom. Here we are faced with the ultimate alternative that is at stake in the dispute between faith and unbelief: are irrationality, lack of freedom and pure chance the origin of everything, or are reason, freedom and love at the origin of being? Does the primacy belong to unreason or to reason? This is what everything hinges upon in the final analysis. As believers we answer, with the creation account and with John, that in the beginning is reason. In the beginning is freedom. Hence it is good to be a human person. It is not the case that in the expanding universe, at a late stage, in some tiny corner of the cosmos, there evolved randomly some species of living being capable of reasoning and of trying to find rationality within creation, or to bring rationality into it. If man were merely a random product of evolution in some place on the margins of the universe, then his life would make no sense or might even be a chance of nature. But no, Reason is there at the beginning: creative, divine Reason. And because it is Reason, it also created freedom; and because freedom can be abused, there also exist forces harmful to creation. Hence a thick black line, so to speak, has been drawn across the structure of the universe and across the nature of man. But despite this contradiction, creation itself remains good, life remains good, because at the beginning is good Reason, God’s creative love. Hence the world can be saved. Hence we can and must place ourselves on the side of reason, freedom and love – on the side of God who loves us so much that he suffered for us, that from his death there might emerge a new, definitive and healed life. As a wise friend down South reflected in a note the other day, "Tough days, these, to go through. "Not so tough, though, that the light of the Paschal Mystery cannot overwhelm the shadows." Indeed, the Light can break through... but only so long as we let it. I don't know about you, but my favorite moment of the year comes tonight as the church glows with the new fire of Easter. The image remains imprinted in my head always, and in it is a priceless lesson -- well, a couple. For one, messy as it can be sometimes, fire sure beats a light-bulb... but even more, the place can only ever be as bright as there are the number of us. Regardless of our virtues, our crosses, our "status" and sins, the lights we carry are all equal, all the same size. And all the while, even in our finest hour, we will still leave wax on the pews. More and more as time goes on, I pinch myself at the thought of being a part of all this, this church -- I'm not worthy of it, and I know I never could've kept on alone... and that latter bit just becomes all the truer with time. So as I stand there, now just a couple hours away, dripping wax all over the place (per usual), just know that, as always, but even moreso here, I'll be thinking of and praying for all of you, the many lights beyond who've made the path bright, warm and beautiful, and in doing so, have kept me blessed and able to keep following it. As Christ is Truly Risen, especially in this hour and amid the backdrop of the sorrows and heartbreaks of these days, may he rise all the more anew in our hearts and minds, that he might rise all the more anew in the Risen Body that is his church. To the hundreds of thousands the world over joining us tonight, a million welcomes -- make yourself comfortable; if you need anything, ask... and feel free to raid the fridge, the books, whatever: it's all yours now as much as it's anyone else's. And to all of you, the church which carries the Light day in and day out to more people and in more ways than you probably know, Christus Surrexit Est, Alleluia! Christos anesthi! Buona Pasqua y Buenas Pascuas a todos -- He is Risen! To one and all, every wish for a joyous, happy and Blessed Easter. 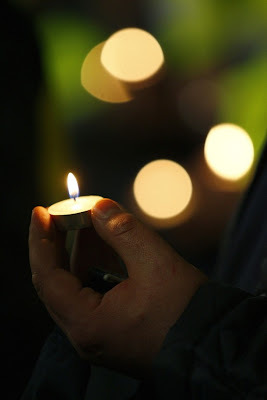 And tonight, just as we will have watched the Light rise and glow and and taken it into our hands, so may we bring it ever more brightly inside, that we might reflect it ever better and carry it forward anew in these 50 Days to come, and always. To one and all, a blessed Holy Saturday... and hopefully yours is off to a quiet start. 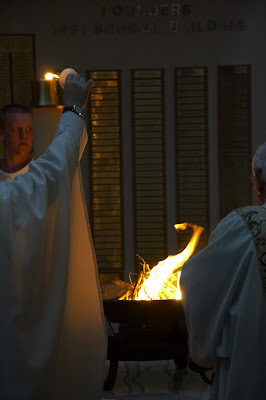 Keeping with the spirit of the day -- at least, its pre-dusk part -- below you'll find what's arguably the definitive reflection on this morning's expectant silence: the anonymous "ancient homily" once given on this day, and accordingly employed every Easter Eve in the breviary's Office of Readings. "I Have Promised You My Own Life... I Have Given You My Death"
This evening, in faith, we have accompanied Jesus as he takes the final steps of his earthly journey, the most painful steps, the steps that lead to Calvary. We have heard the cries of the crowd, the words of condemnation, the insults of the soldiers, the lamentation of the Virgin Mary and of the women. 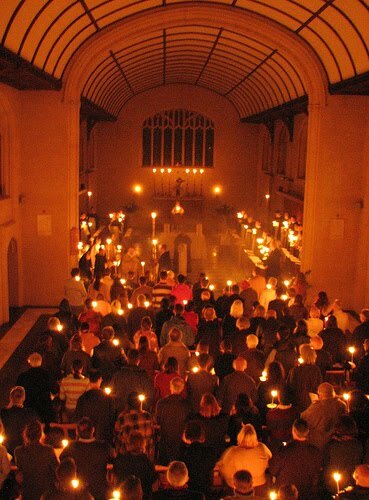 Now we are immersed in the silence of this night, in the silence of the cross, the silence of death. It is a silence pregnant with the burden of pain borne by a man rejected, oppressed, downtrodden, the burden of sin that mars his face, the burden of evil. Tonight we have relived, deep within our hearts, the drama of Jesus, weighed down by pain, by evil, by human sin. What remains now before our eyes? 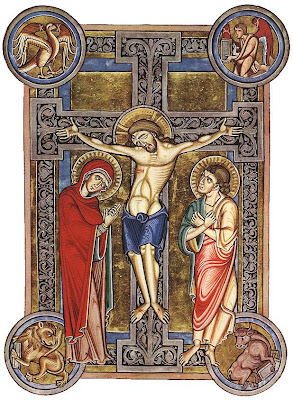 It is a crucified man, a cross raised on Golgotha, a cross which seems a sign of the final defeat of the One who brought light to those immersed in darkness, the One who spoke of the power of forgiveness and of mercy, the One who asked us to believe in God’s infinite love for each human person. Despised and rejected by men, there stands before us "a man of suffering and acquainted with infirmity, one from whom others hide their faces" (Is 53:3). But let us look more closely at that man crucified between earth and heaven. Let us contemplate him more intently, and we will realize that the cross is not the banner of the victory of death, sin and evil, but rather the luminous sign of love, of God's immense love, of something that we could never have asked, imagined or expected: God bent down over us, he lowered himself, even to the darkest corner of our lives, in order to stretch out his hand and draw us to himself, to bring us all the way to himself. The cross speaks to us of the supreme love of God and invites, today, to renew our faith in the power of that love, and to believe that in every situation of our lives, our history and our world, God is able to vanquish death, sin and evil, and to give us new, risen life. In the Son of God’s death on the cross, we find the seed of new hope for life, like the seed which dies within the earth. This night full of silence, full of hope, echoes God’s call to us as found in the words of Saint Augustine: “Have faith! You will come to me and you will taste the good things of my table, even as I did not disdain to taste the evil things of your table... I have promised you my own life. As a pledge of this, I have given you my death, as if to say: Look! I am inviting you to share in my life. It is a life where no one dies, a life which is truly blessed, which offers an incorruptible food, the food which refreshes and never fails. The goal to which I invite you … is friendship with the Father and the Holy Spirit, it is the eternal supper, it is communion with me … It is a share in my own life (cf. Sermon 231, 5). Let us gaze on the crucified Jesus, and let us ask in prayer: Enlighten our hearts, Lord, that we may follow you along the way of the cross. Put to death in us the "old man" bound by selfishness, evil and sin. Make us "new men", men and women of holiness, transformed and enlivened by your love. 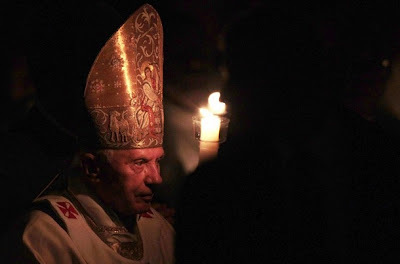 In keeping with the the liturgy's ancient custom for this day for every prelate -- preserved in the modern Ceremonial for Bishops -- the papal ring stayed off for the evening rite. With the preacher of the Papal Household invariably delegated the preaching duties at today's Liturgy of the Passion, the end of the Via Crucis is normally the pontiff's lone unscripted intervention of the calendar's most difficult 24 hours. This year, however -- in a fairly groundbreaking move (a là his BBC turn at Christmas) -- Benedict took his favored style of interaction to the airwaves on this Good Friday afternoon, answering seven questions on the state broadcaster RAI on topics that ranged from suffering, to peace to the Lord's death and resurrection. The queries submitted by the network's audience, the Holy See quickly circulated a full English translation of the questions and the Pope's answers, which were aired at 3pm Italian time today. The above is the first of four parts of A Sua Immagine ("In His Image") -- the rest can be found here. “Father, forgive them, for they know not what they do” (Lk 23:34). At the height of his Passion, Christ does not forget man, especially those who are directly responsible for his suffering. Jesus knows that more than anything else man needs love; he needs the mercy which at this moment is being poured out on the world. “Truly, I say to you, today you will be with me in Paradise” (Lk 23:43). This is how Jesus replies to the plea of the criminal hanging on his right: “Jesus, remember me when you come into your kingdom” (Lk 23:42). The promise of a new life. This is the first fruit of the Passion and imminent Death of Christ. A word of hope to man. At the foot of the Cross stood Mary, and beside her the disciple, John the Evangelist. 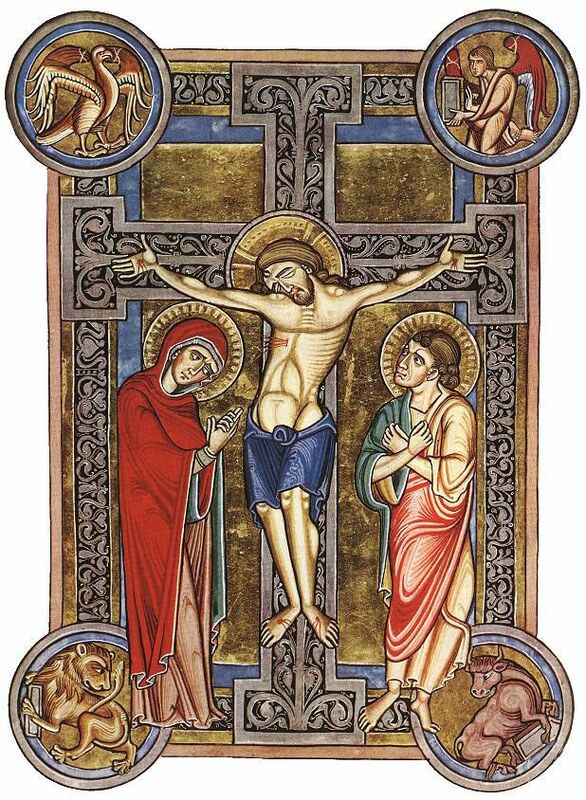 Jesus says: “Woman, behold your son!” and to the disciple: “Behold your mother!” (Jn 19:26-27). “And from that moment the disciple took her to his own home” (Jn 19:27). This is his bequest to those dearest to his heart. His legacy to the Church. The desire of Jesus as he dies is that the maternal love of Mary should embrace all those for whom he is giving his life, the whole of humanity. Immediately after, Jesus cries out: “I am thirsty” (Jn 19:28). A word which describes the dreadful burning which consumes his whole body. It is the one word which refers directly to his physical suffering. Then Jesus adds: “My God, my God, why have you abandoned me?” (Mt 27:46; cf. Ps 22:2). These words of the Psalm are his prayer. Despite their tone, these words reveal the depths of his union with the Father. In the last moments of his life on earth, Jesus thinks of the Father. From this moment on, the dialogue will only be between the dying Son and the Father who accepts his sacrifice of love. When the ninth hour comes, Jesus cries out: “It is accomplished!” (Jn 19:30). Now the work of the redemption is complete. The mission, for which he came on earth, has reached its goal. “Father, into your hands I commit my spirit” (Lk 23:46). And having said this, he breathed his last. 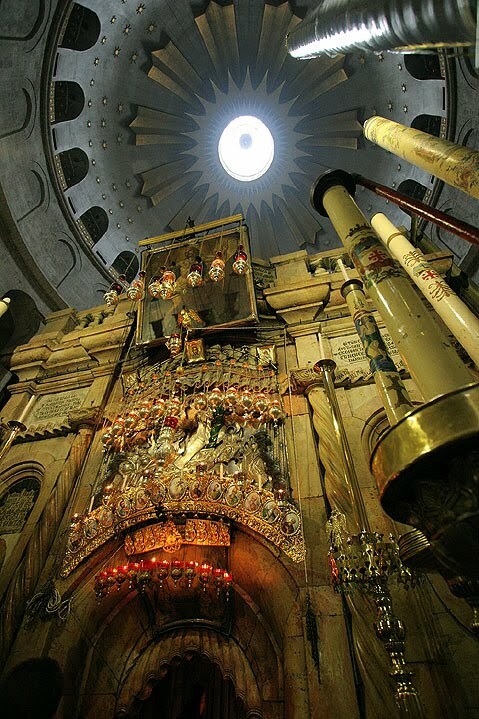 “The curtain of the temple was torn in two...” (Mt 27:51). The “Holy of Holies” of the Jerusalem Temple is opened at the moment when it is entered by the Priest of the New and Eternal Covenant. with all their weaknesses and sins. the fruits of your death. “They tear holes in my hands and my feet; I can count every one of my bones” (Ps 21:17- 18). The words of the Prophet are fulfilled. The torturers’ blows crush the hands and feet of the Condemned One against the wood of the Cross. The nails are driven violently into his wrists. 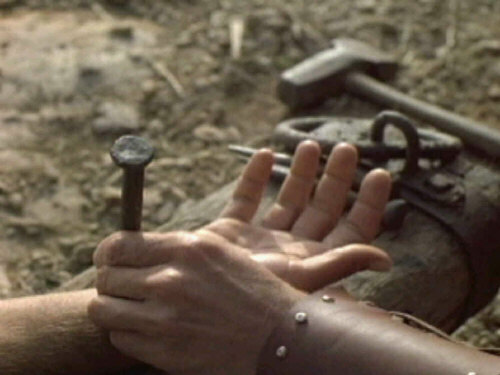 Those nails will hold the condemned man as he hangs in the midst of the inexpressible torments of his agony. In his body and his supremely sensitive spirit, Christ suffers in a way beyond words. With him there are crucified two real criminals, one on his right, the other on his left. The prophecy is fulfilled: “He was numbered among the transgressors” (Is 53:12). 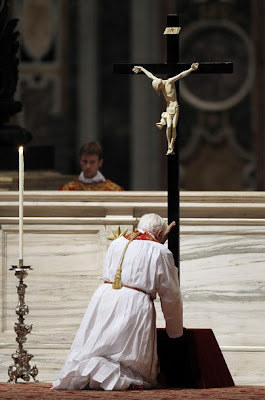 Once the torturers raise the Cross, there will begin an agony that will last three hours. This word too must be fulfilled: “When I am lifted up from the earth, I will draw all people to myself” (Jn 12:32). What is it that “draws” us to the Condemned One in agony on the Cross? Certainly the sight of such intense suffering stirs compassion. But compassion is not enough to lead us to bind our very life to the One who hangs on the Cross. How is it that, generation after generation, this appalling sight has drawn countless hosts of people who have made the Cross the hallmark of their faith? Hosts of men and women who for centuries have lived and given their lives looking to this sign? boundless Love, which has utterly filled every absence of love and allowed humanity to find refuge once more in the arms of the merciful Father. May Christ lifted high on the Cross draw us too, the men and women of the new millennium! In the shadow of the Cross, let us “walk in love, as Christ loved us and gave himself up for us, a fragrant offering and sacrifice to God” (Eph 5:2). “I am a worm, and no man; scorned by men, and despised by the people” (Ps 22:6). These words of the Psalm come to mind as we see Jesus fall to the ground a second time under the Cross. Here in the dust of the earth lies the Condemned One. Crushed by the weight of his Cross. His strength drains away from him more and more. But with great effort he gets up again to continue his march. To us sinners, what does this second fall say? 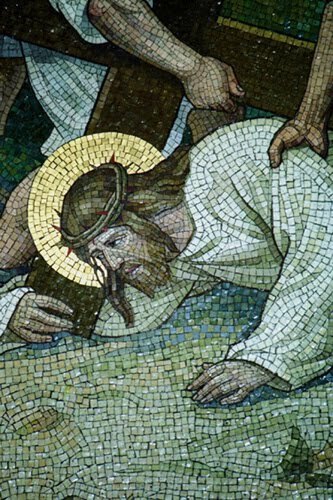 More than the first one, it seems to urge us to get up, to get up again on our way of the cross. Cyprian Norwid wrote: “Not behind us with the Saviour’s Cross, but behind the Saviour with our own Cross.” A brief saying, but one that conveys much truth. It explains how Christianity is the religion of the Cross. It tells us that every person here below meets Christ who carries the Cross and falls under its weight. In his turn, Christ, on the way to Calvary, meets every man and woman and, falling under the weight of the Cross, does not cease to proclaim the good news. For two thousand years the gospel of the Cross has spoken to man. For twenty centuries Christ, getting up again from his fall, meets those who fall. Throughout these two millennia many people have learned that falling does not mean the end of the road. “My grace is sufficient for you; for my power is made perfect in weakness” (2 Cor 12:9). Comforted, they have gotten up again and brought to the world the word of hope which comes from the Cross. Today, having crossed the threshold of the new millennium, we are called to penetrate more deeply the meaning of this encounter. Our generation must pass on to future centuries the good news that we are lifted up again in Christ. and you get up again in order to take it upon yourself and cancel it. the Gospel of your saving power. be praise and glory for ever.